Terasic Technologies Inc., the leading provider of state-of-the-art FPGA prototyping systems, announced that Altera Corporation once again awarded Terasic Technologies the Supplier Excellence Award for outstanding partnership support during 2008. 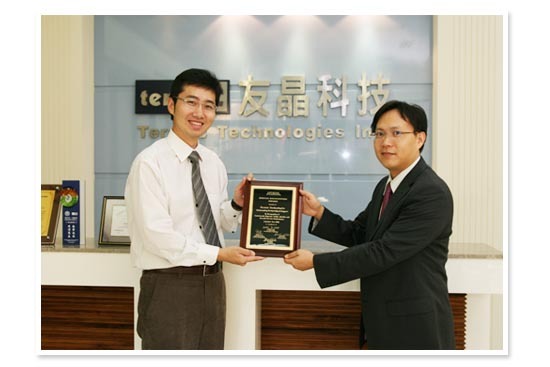 Terasic Technologies also received this award in 2006. Altera Corporation (NASDAQ:ALTR), the world's pioneer in system-on-a-programmable chip (SOPC) solutions, provides high-value programmable solutions. Terasic Technologies is a highly recognized Altera partner in FPGA platform developing and manufacturing. “Terasic Technology has cooperated with Altera for years and really done well. Terasic Technologies has shown exemplary support of the latest high-end FPGA platform developing and our world-wide sales” said Stephen Brown, Supervising Architect Software and IP Engineering and Altera University Program Manager." Terasic produced highly optimized FPGA systems, supported most of the Eastern Asia SOPC events and continued to be responsive to our needs. Also, Terasic Technology has helped 18 universities in Taiwan to establish Altera Joint Lab since 2007. Your work has contributed to the benefit of Altera and we are pleased to have you as a trusted partner." Sean Peng, Terasic Technologies' Chief Executive Officer, was very excited and said, "After receiving this award in 2006, Terasic Technology has focused on self-enrichment and independent innovation. We are really honored to receive this prestigious award twice. The recognition has encouraged us to continuously keep our service standard up. Terasic's goal is to provide the perfect product that reduces cost and time-to-market. Terasic Technology will continue to develop high-quality FPGA platforms and provide world-wide customers our best services. We look forward to keeping our long, mutually trusted relationship with Altera Corporation." Terasic Technologies is the leading provider in high-performance hardware and Terasic Technology designed FPGA development platform for Altera, such as Altera DE2 , Cyclone II Starter Kit, Cyclone III FPGA Starter Kit and the latest high-end Stratix IV FPGA development platform. Terasic Technology Received Supplier Excellence Award from Altera Corporation in 2006 and 2008. Now, Terasic Technology, as the Altera certified design center in Asia, is in charge of promoting Altera Joint Lab in Taiwan and providing technical support.